Alabama’s longest serving incumbent legislator, Hinton Mitchem, announced his retirement recently after serving 32 years in the Alabama Senate and 4 years in the Alabama House. Hinton is a native of Oconee County, Georgia, 1956 Graduate of Oconee County High School and 1960 graduate of the University of Georgia. Natives and longtime residents of Oconee County remember a blonde headed fellow who played basketball and was involved in school activities. Hinton grew up at Eastville and had three sisters, one of whom, Barbara Mitchem Lucas (Cicero) was in my 1958 Graduating Class. He was one of many Oconee County commuters to UGA in the 50’s and early 60’s. I was one of that group who ate often and socialized at the Varsity, across from the arch in Athens. Hinton has not forgotten his roots. He attended many UGA Football games over the years. He has also attended on a frequent basis the annual OCHS Alumni Banquet. Last year, he was serving on a brainstorming session on how to promote Oconee County Schools and Alumni activities. He has kept his humility and friendliness over the years. For more information about his Oconee roots, see AVOC article dated January 11, 2007. 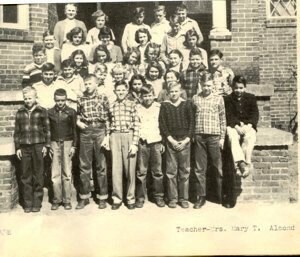 Hinton Mitchem is on the front row (first on left) in a picture of his Sixth Grade Class at Watkinsville in 1949-50. The picture was taken in front of the Oconee County High School Building (now home of OCAF) as it appeared before fire destroyed the second floor around 1954-5. Hinton has been described as a Statesman in the Albertville, Alabama Reporter in recent articles.He has a rich legacy in Alabama. He makes his family and old friends and classmates proud. BEST WISHES, HINTON! You did us proud! One of Alabama’s most venerable senators is not seeking re-election in 2010, opting to spend more time with his family. Our View on the Issue is an opinion of The Reporter’s editorial board. Alabama Senator Hinton Mitchem (D-Union Grove) announced his intentions to retire from the state’s most powerful legislative body at the end of this current term. Mitchem was first elected to the state house in 1974 and joined the senate four years later. For all those years, he has been a force, leading with a steady hand and, unlike many, willing to listen and compromise. Those traits alone elevated him beyond the titles of senator or politician. He has been a rare breed. He has been a statesman. There are few. Mitchem will be missed, not only in his senate district but on a statewide level, as well. We sincerely thank him for his leadership and his public service. We wish him nothing but the best in his retirement. Alabama Sen. Hinton Mitchem said the strong GOP trend in his district had nothing to do with his decision not to seek re-election in 2010.